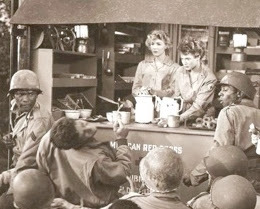 Watching the movie Red Ball Express and saw a few Coleman lanterns including an Early Bighat, sitting behind Sydney Poitiers character in one scene. Here is one scene clip. 1:10:54 1:17:21 1:23:31 1:25:20 1:26:00 1:36:00 1:37:49 1:41:16 There are more in here that I missed. There's also one early on at 38:25 but it doesn't have a mil-spec burner. Looks more like a 220E. From the Sopranos.....Tony B and Christopher relocating former retired assists. Second time this has happened how did my picture end up above mine and in his post? That looks like a Frankie. 275 fount on a 220? Looks like a Avocado Sears only darker. Seen one in the first Terminator movie when the terminator is in the cabin mimicking her mom/grandma over the telephone.
. I pointed that out to my wife a while back. She shook her head and laughed at me. It's a sickness, I swear. 😂😂 I believe so as well. About 15 minutes before the end they crash into an old mine shaft. A short way in the mine they light up a 220 (probably an E?). From the beginning scene of Predator (1987). Looks like a 237 Kerosene. Ahhhh....Predator. the only movie with 2 Governors. GET TO THE CHOPPA! Almost 3! Sonny Landham, who played Billy, ran unsuccessfully for governor of Kentucky about 20 years ago. I just watched "Highwaymen" on Netflix last night. No shortage of quicklites in that movie. Walking dead episode from two weeks ago, quick camera pan over what looked like a 220E. Found another one. A Guy Named Joe. 1943. Spencer Tracey, Van Johnson, Ward Bond. Looks like a big hat.